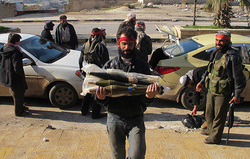 The Free Syria Army has taken the bull by the horn, forget reliance on powers not forthcoming to help by producing its own arms, the New York Times reported. A reminder that necessity is the mother of invention, a phrase which origins is unknown, but ascribed to Plato - meaning that difficult situation inspire ingenious solution. The FSA has been relying on freedom loving nations for help. But the help has been coming in trickles for several reasons - among them being lack of trust between the army and its helpers. The helpers want to ensure that there are no terror groups in the FSA. The army says its main objective is to unseat Bashar al-Assad, and it does not matter who is fighting along with them. The matter became troublesome to the helping nations, when confirmed that there were Al-Queda groups on the ground in Syria. The fear that the terror groups may spring surprises against the interests of Western nations like they have done in Libya has caused foot dragging by FSA helpers. Just few days ago, Assad caused consternation, when he said he had received S- 300 Missile Defense System from Russia, capable of keeping Western powers from intervention in Syria. Some Western Nations urged Vladimir Putin not to deliver to Assad in what observers said amounted to begging Putin. Consequently, the FSA said it would not attend the peace talk, schedule for Geneva between it and Assad forces, if it does not receive arms to boost its position against Assad. The FSA has been losing towns to Assad following ground help to Assad from the Hezbollah; leading to the loss of Quisair and a likely Armageddon in the coming battle over Aleppo. The United Nations estimates that over 90,000 lives have been lost in the Syrian war.